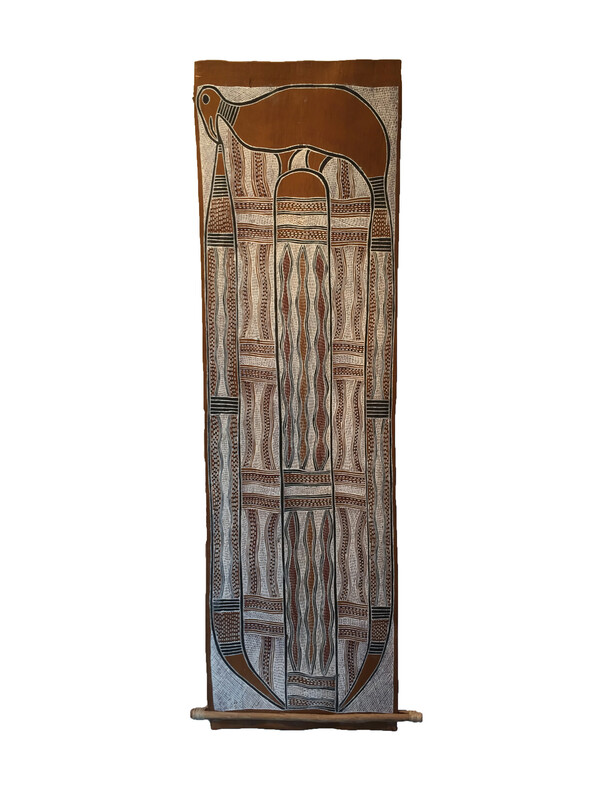 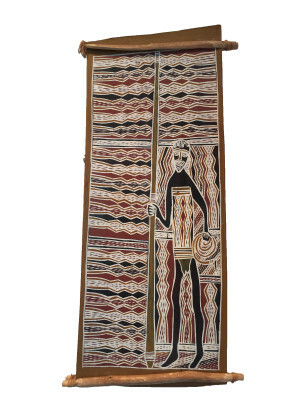 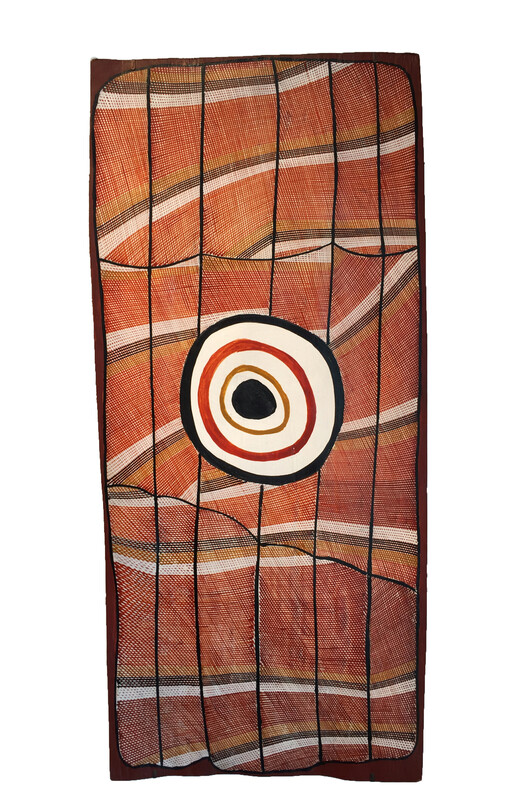 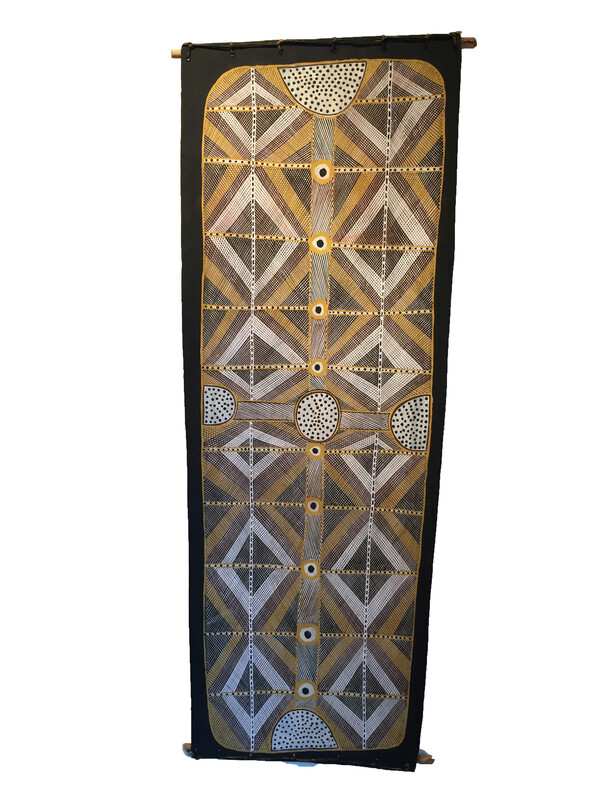 To celebrate twenty-nine years of exhibiting indigenous Australian art in London, the Rebecca Hossack Art Gallery presents an exhibition of seventeen bark paintings from the Northern Territory, which were completed between the 1960s and 1990s. 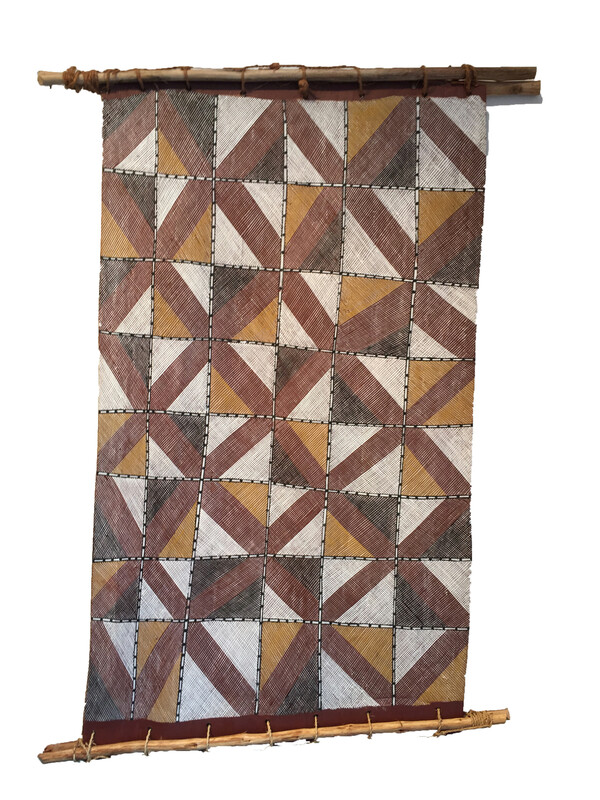 It is only in the last fifty years that people have painted in ochre on bark for strictly commerical purposes. 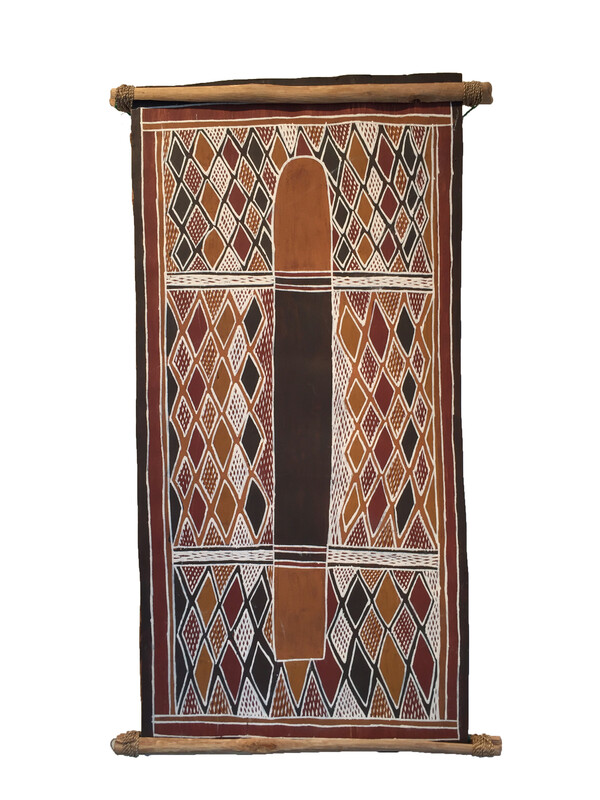 However, the techiques are closely related to cultural practices that predate European contact in this region. 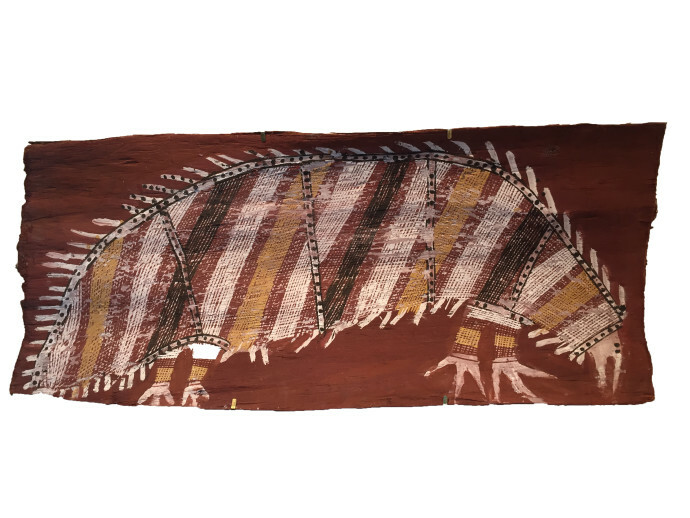 Painting on the inside of bark shelters built during the wet season is the most direct antecedent of bark painting as it is today, but the techniques are similar to those used in rock art found in galleries throughout the stone country in Arnhem Land, and also to the elaborate designs painted on men's bodies for ceremony. 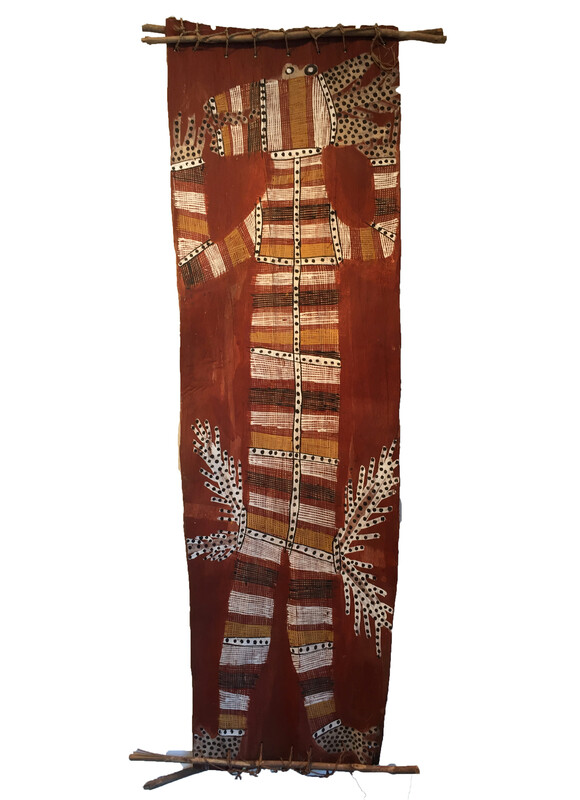 Bark for paintings is taken from the stringybark (Eucalyptus tetradonta) and needs to be flattened, smoothed and cured before it is ready to use. 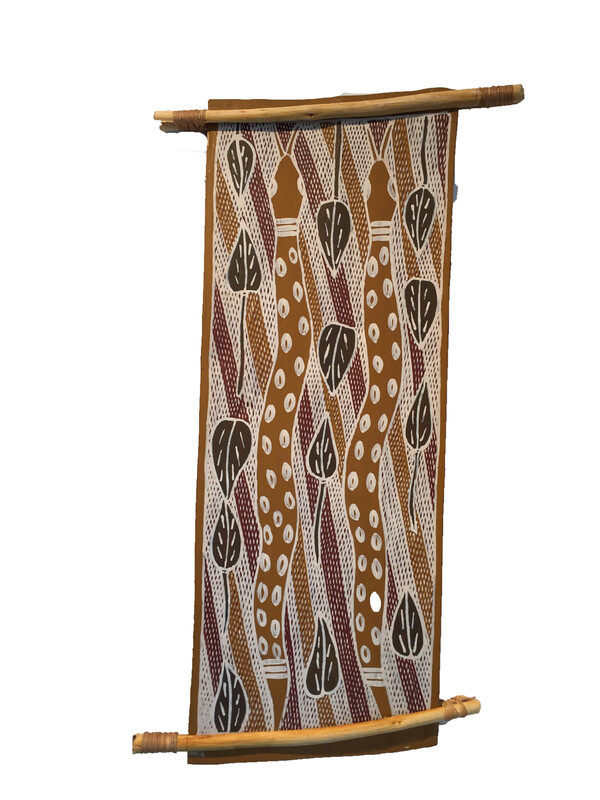 It is easiest to remove in the wet season; during the dry season the sap dries up, causing the bark to cling to the tree. Artists use four basic colours: white, yellow and red ochre, and black charcoal. 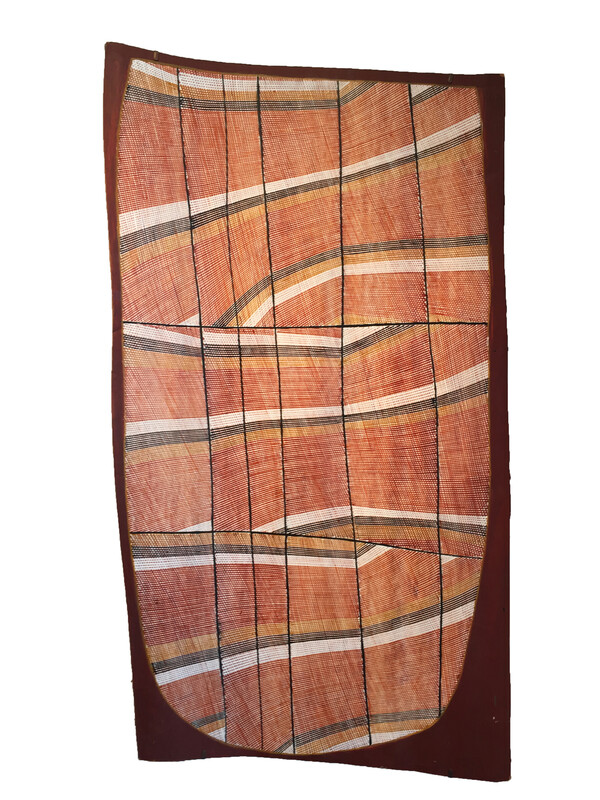 These are mixed with a fixative and applied to the bark with a reed brush or a very fine paintbrush. 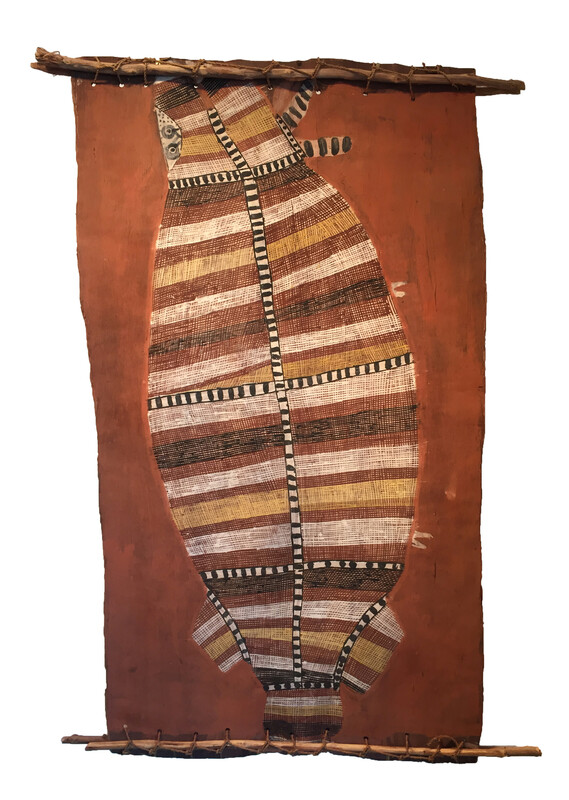 Kuninjku artists from the stone country tend to paint in a style which has strong aesthetic links to rock art: often a plain ochre background is used, with a spirit figure or animal depicted in detail against it. 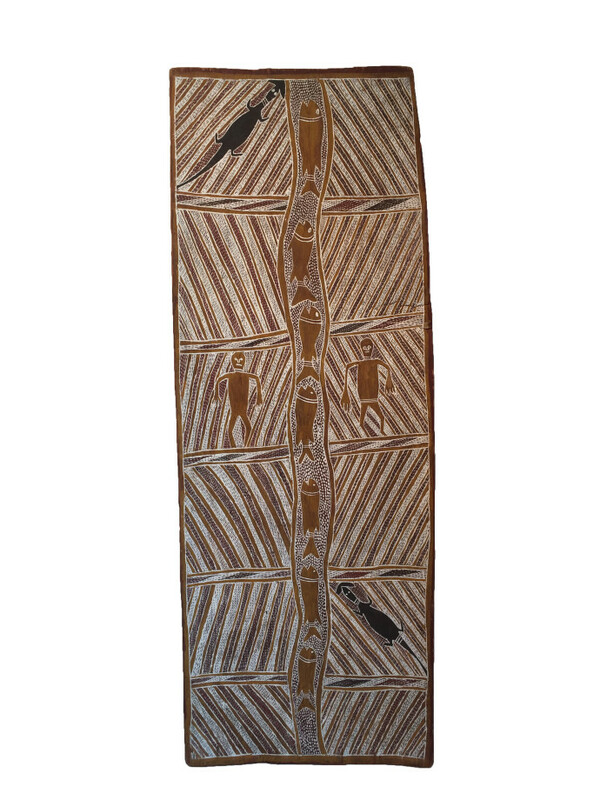 The cross-hatching, a hallmark of most painting from Arnhem Land, is usually used inside the figure, which includes the well-known 'x-ray style', where animals are depicted in strikingly accurate detail. Eastern groups, such as Burarra, use cross-hatching to cover the background of their paintings, with designs in solid colours. 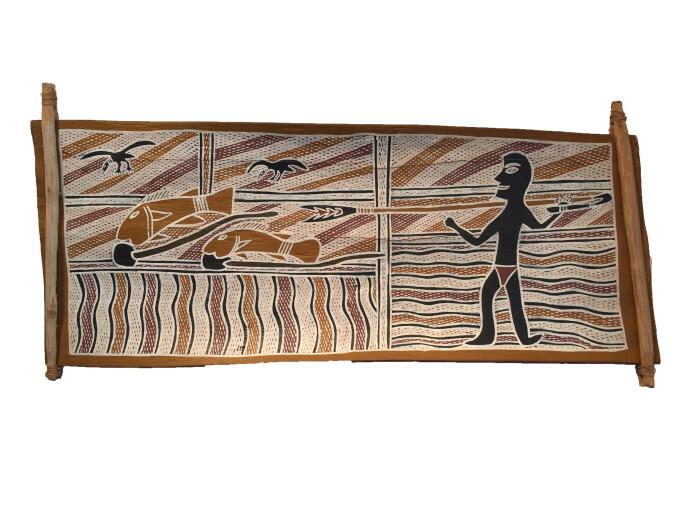 Some barks are crowded with imagery, particularly scenes of hunting or ceremony, whilst other designs are more abstract. Further East, cross-hatching is replaced altogether with dotted infill small motifs that cover the whole bark. 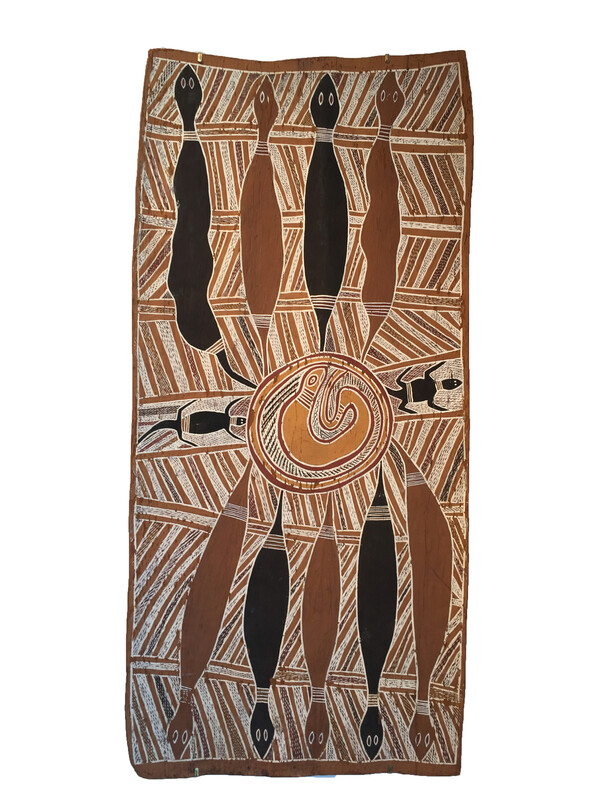 Artists throughout the region are united in painting their Dreaming - a personal totem relating to their clan lands. In addition, they paint spirit figures, but their subjects also extend to purely secular interpretations of common plants and animals - catfish, barramundi, crocodile and waterlily.